How To Equip A Small Hallway In The Apartment? A small hallway is a real disaster for the most apartment. Especially noticeable lack of space is felt with the arrival of guests in large families, including one and several children. If bicycles, rollers, scooters, and prams still somehow manage to attach in the common corridor on the floor, then with shoes and clothing is not so simple. 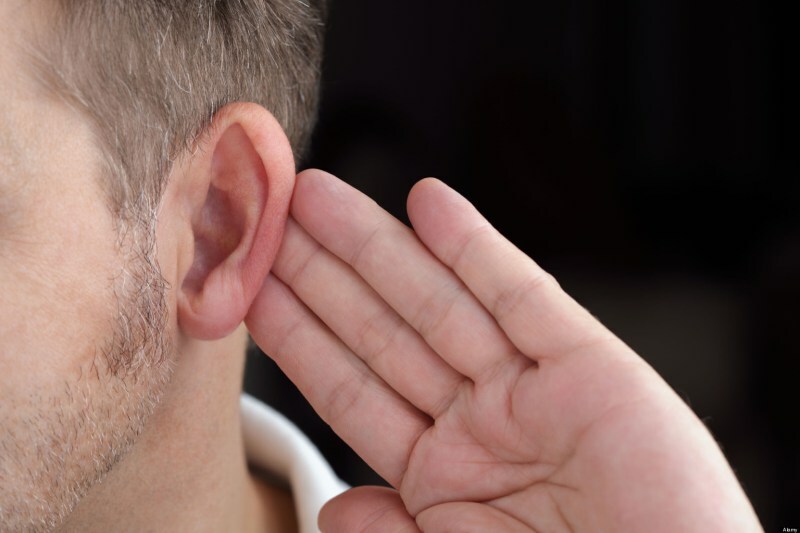 However, there are similar problems with single singles, young and elderly couples. Everyone wants not just to squeeze a shoemaker and a mirror with a cupboard into tiny space, but to make it beautiful. 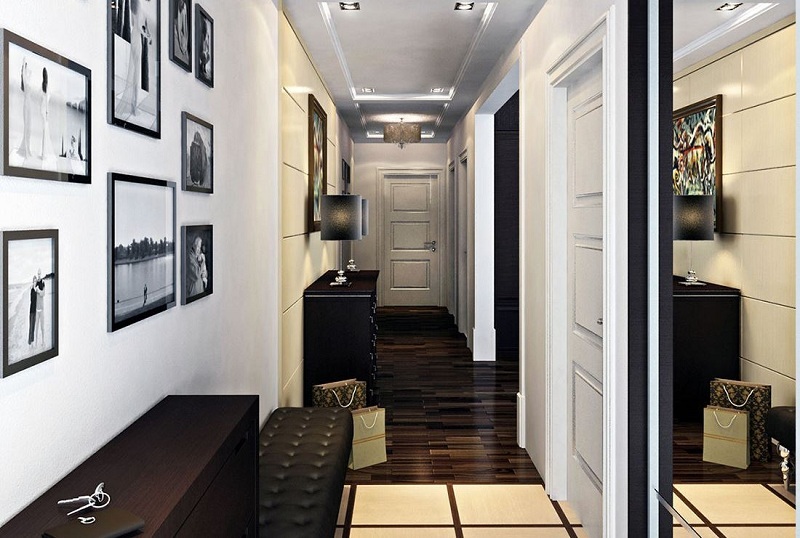 How to equip a small hallway with your own hands so that it would be as functional as possible and please the eye, as in the photo in magazines? 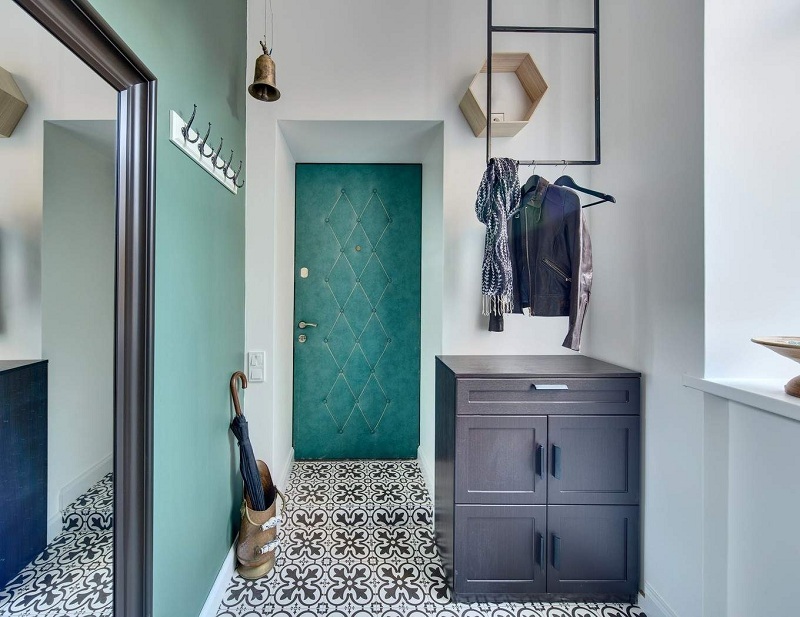 One of the correct answers to the question of how to equip a small hallway is a reasonable use of color solutions. For painting walls, it is better to take light shades. It is not necessary to create at the entrance to the apartment a sort of operating room, making the walls and ceiling snow white. Pay attention to soft and warm beige, cream tones with lavender, lilac, blush, mint notes, as in the photo. A beautiful gray tint will emphasize the whiteness of the ceiling, moldings, baseboards and will not be as branded as pure white. The paint can be replaced with plain or decorated with a small pattern wallpaper of the same tones. High ceiling moldings, smoothly turning into a white ceiling, visually lift it. If there is no natural lighting in the hallway (the most common option), and the layout of the apartment allows, make the partition between the hallway and the next room partially transparent by inserting light transmitting glass in the top or side of the living room, or replace it with a rack, as in the photo . Similarly, open space will add sliding glass doors. From the door to the hallway can be completely abandoned, replacing them with an arched or rectangular opening. In addition to the monochromatic light colors and wallpaper with a small pattern, striped walls will do a good job. The strips can start from the floor itself or 40-70 centimeters from it, the lower part should be in a neutral light shade. Vertical stripes will make the walls and ceiling visually higher, and horizontal ones will give a small hallway a volume. 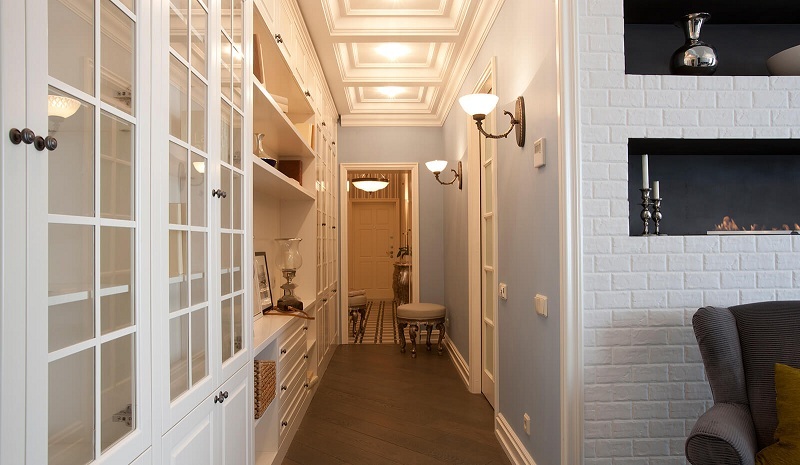 Another popular way of arranging small and narrow hallways is to use a contrasting wall decoration. 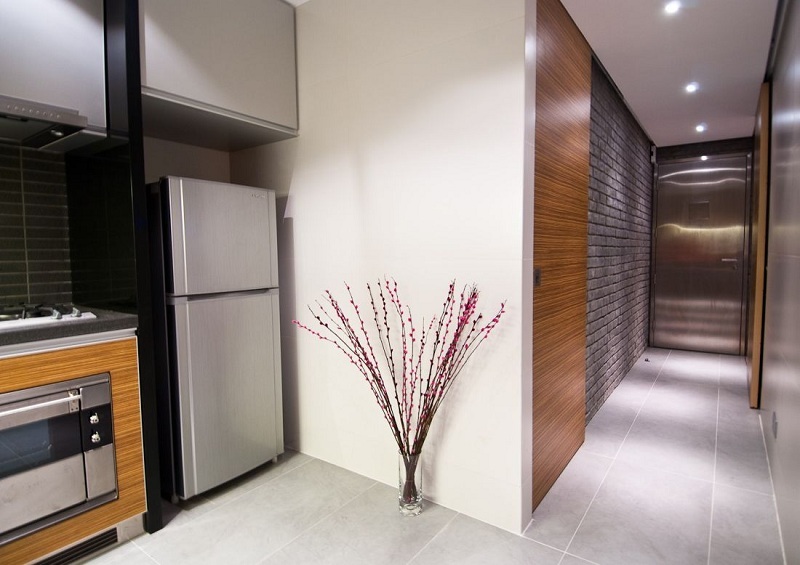 If the room resembles a rectangle, its smaller side can be made darker or brighter, this wall will visually approach, and the hallway will acquire a more regular shape. You should not use such decorative brick, plaster, wall panels or drywall in a small hallway. They will take precious centimeters not only visually, but also real. As a rule, in small spaces, styles that require a minimum of décor, a meager set of practical and multifunctional furniture ideally take root, and they are exposed to light shades. Minimalism is an ideal option for arranging a small hallway, as well as Scandinavian or any modern style that has the above characteristics. 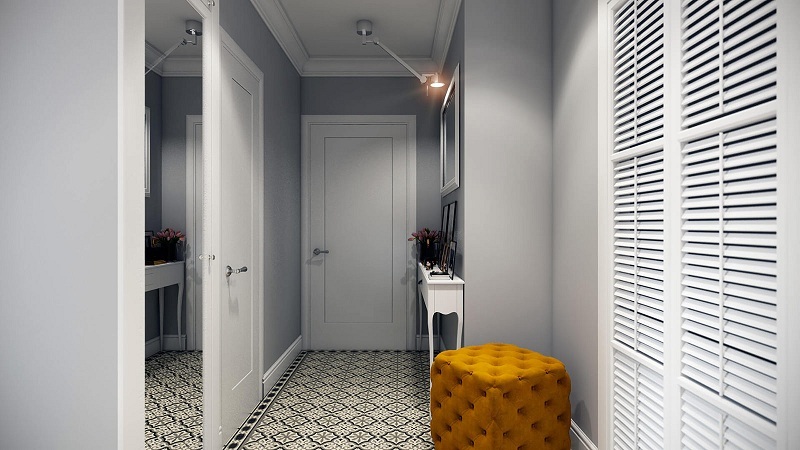 Light walls, neutral shades of furnishings, several bright accents, giving comfort, plenty of lamps, non-marking (possibly glossy) flooring made of parquet board or ceramic tiles (including diagonally laid) – such is the ideal small hallway. To create the effect of compatibility with other rooms, use a common style and similar finishing materials. So, a single floor covering of dark or light boards without thresholds will combine the hallway with the living room, corridor, kitchen. Monochromatic walls, similar chandeliers, and sconces will help to realize the idea of a single harmonious space and distract attention from the small size of the room. For a wet and dirty area at the entrance, a nice rug or a patch of tiles lined with contrasting tiles will do. In small spaces, designers recommend using several lights for different lighting and volume scenarios. It is no secret that a well-lit room always seems larger than a dark of similar size. 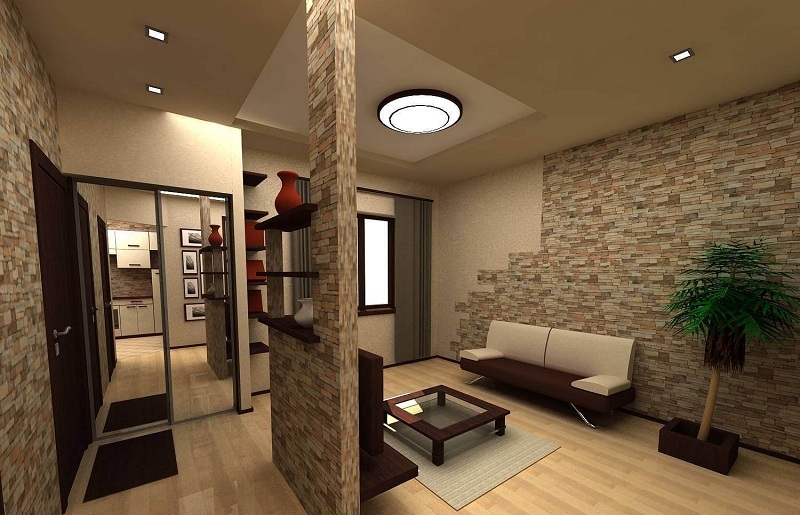 Since there is no space for floor lamps, it is necessary to make maximum use of the walls and ceiling. Instead of one central ceiling chandelier, hang a few beautiful hinges around the center or spot LEDs around the perimeter of the ceiling. It is also necessary to highlight the mirror (a required element of the hallway). If it is located on the wall above the cabinet or console, install two sconces on the sides, if built into the closet – the LEDs on the top bar will help or on the sides if it hangs on the front door – decorate it with a garland. Similarly, you can arrange a wall or wall mirror. 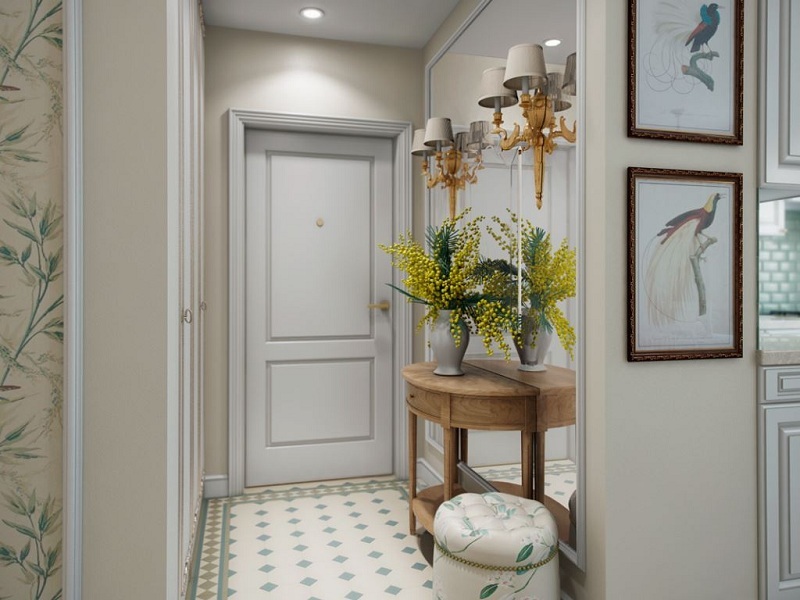 In addition to color, light and style, furniture, a mirror (or mirrors) and decorative design, giving coziness, comfort and individuality to the room play an important role in arranging a small hallway. Bright, beautiful accents will distract from the sizes, the hall will become stylish, having lost facelessness. 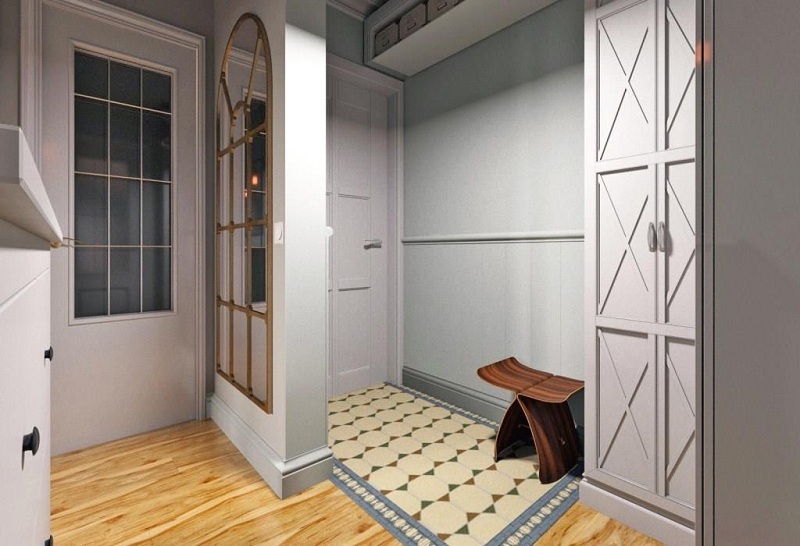 Ideal furnishing for a tiny hallway, if you are going to store there not only keys and umbrellas, but jackets, raincoats, hats, gloves and a few pairs of shoes – this is custom-made furniture. A mirrored wardrobe, built into a niche, a corner, a partition between two rooms, with high mezzanines and spacious shelves, will solve a lot of problems. 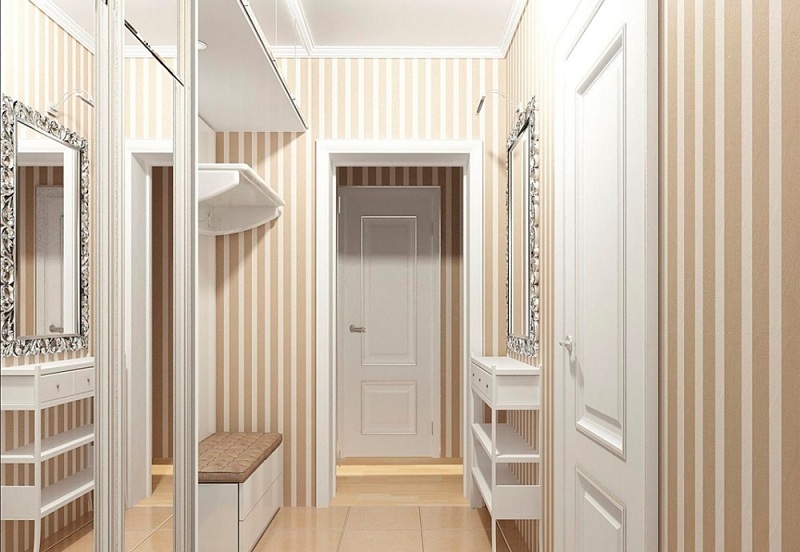 You can also order a narrow wardrobe, in which the clothes bars are located not parallel to the doors, but perpendicularly. Special slim-model furniture is produced: narrow chests of 30-40 centimeters deep, cabinets, cabinets and cabinets, shoemakers. Shelves in them are located almost vertically, so they are not suitable for high boots and shoes with heels. 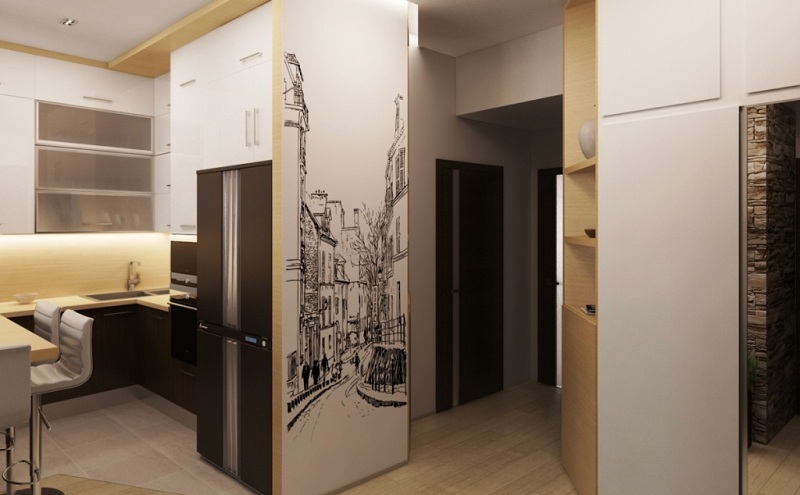 Not bad, if the furniture will match the walls, merge with them, this technique will visually push the walls of a small room, as in the photo below. A narrow drawer ottoman under the mirror will help with the convenience of wearing shoes. Inside you can store both the shoe itself and its care products. If there is no room for furniture at all, use every square centimeter of walls: hang shelves, regular and corner, coat hooks, you can place wicker baskets for accessories on large shelves, such baskets with shoes will fit under the bench. Two or one vertical cupboards and mezzanine on the sides and above the entrance door will also save the situation. The minimum set of furniture for a tiny hall includes a place where you can put shoes and hang clothes when you come from the street (a wall or floor hanger, a rug or stand dryer for boots and sneakers), a shelf for small things, an ottoman and a mirror. In this case, all other unused items in a given season should be stored in other rooms. If there is a window in the hallway – this is a huge plus. This is both a source of light and a place to sit (on a windowsill with soft pillows). Under the window, you can build a locker or put baskets for shoes and accessories. In the small hallway, mirrors perform several functions. With their help, you will correct your hair and appreciate the appearance before going out. Properly and beautifully placed mirrors at times increase the room, filling it with air and light reflected from the lamps, as in the photo. If large mirror squares do not strain you, feel free to decorate the hallway with them: a wardrobe, a wall, an entrance door, you can make a mirror finish around the perimeter of the room under the ceiling. A full-wall mirror, whole or faceted, reflecting the lights of LEDs, sconces, suspensions or chandeliers, doubles the area of the room, makes it a beautiful, front area where guests and hosts are pleased to be. Although there is no place for abundant and fancy decor in a small apartment and hallway, the measured use of bright accents and accessories can distract attention from the minimum size and make the room beautiful, cozy and well-remembered. Original details look wonderful against the neutral background of light walls and laconic floor: forged hooks or stand for umbrellas, an unusual key holder on the wall, a beautiful flower on a stand or a shelf, vintage lamps or a Tiffany sconce, a colorful ottoman with textile upholstery. There was no room for the console? Draw it on the wall or use a decorative sticker. Will help to increase the room photo wallpaper with perspective, the original painting of one of the walls, painting it with slate paint for notes. Imagine an experiment, and your small hallway will turn into the most original, comfortable and cozy entrance area to the envy of all!